We used a polytarp for a recent trip to the Core Sound of North Carolina's outer banks and it served its purpose well. It kept the rain out during a 35-45 mph storm one night and sheltered us from the wind when it was in the 50's Fahrenheit. But the tent takes a lot of time to setup, is noisy, ugly and bulky. Running the lines under the hull is awkward. Having achieved some sewing success with my third reef project, I decided to embark on another sewing project; a custom fitted camping tent. This project required many 10' to 12' flat felled seams. At first I tried put the sewing machine and fabric on the floor but I quickly found out that my Janome Magnolia 7300 sewing machine doesn't have the power to pull all of that fabric. I solved this problem by following the advice of of Emiliano Marino's "The Sailmaker's Apprentice" and constructing a gravity feed system. I made the first seams using pins. The results were crude and tended to have puckers. Later in the project I ordered a roll of 3/8" Seamstick basting tape. What a difference it made. My seams were more uniform and took far less time. 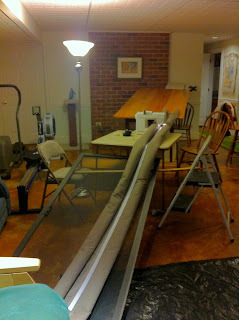 Also halfway through the project, I ordered a walking foot attachment for my sewing machine. It also makes for more uniform seams. 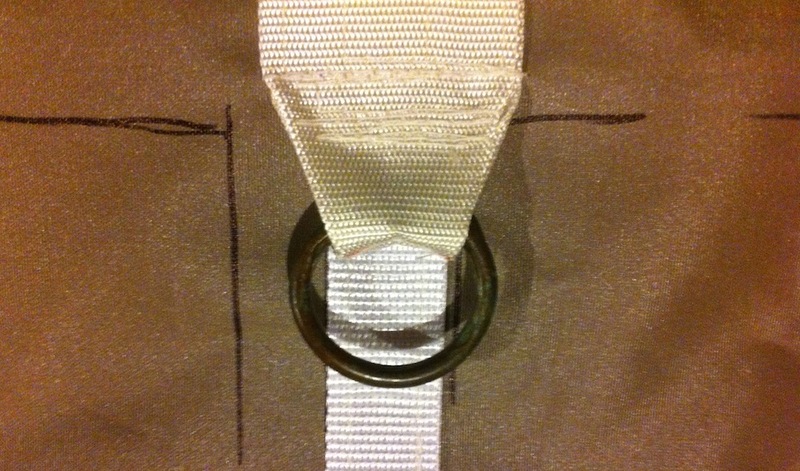 I sewed 1" polyester webbing along the centerline and terminated each end with 2" webbing and a 2" bronze ring. This allows me to stretch the tent taught between the bow and stern and eliminates the need to use the sprit boom as a ridge pole. I clip the mainsheet to the stern ring and pull it taught. 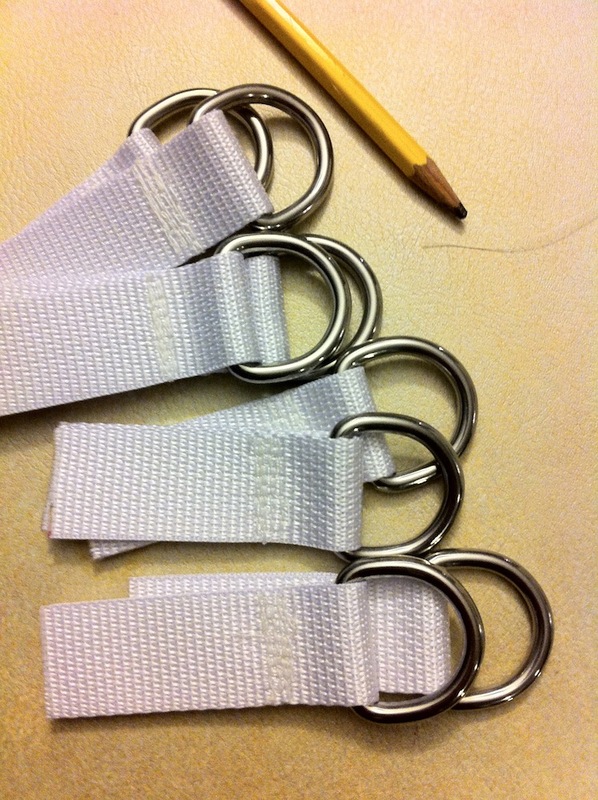 I used stainless rings and webbing to attach the cover to the boat. I found sailrite's how-to videos to be very helpful in figuring out the mechanics of assembly. 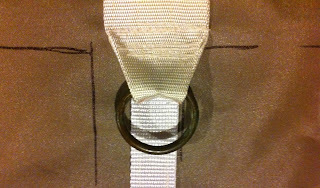 I sewed in sleeves for fiberglass tent hoops but after experimenting with the fully assembled tent, I decided that the hoops added almost nothing and complicated the setup. The sides of the tent clip to lashing hooks fastened underneath the gun'nle. The bow uses a single pole with a line tied to the forward mooring cleat. The stern is open to the air, . 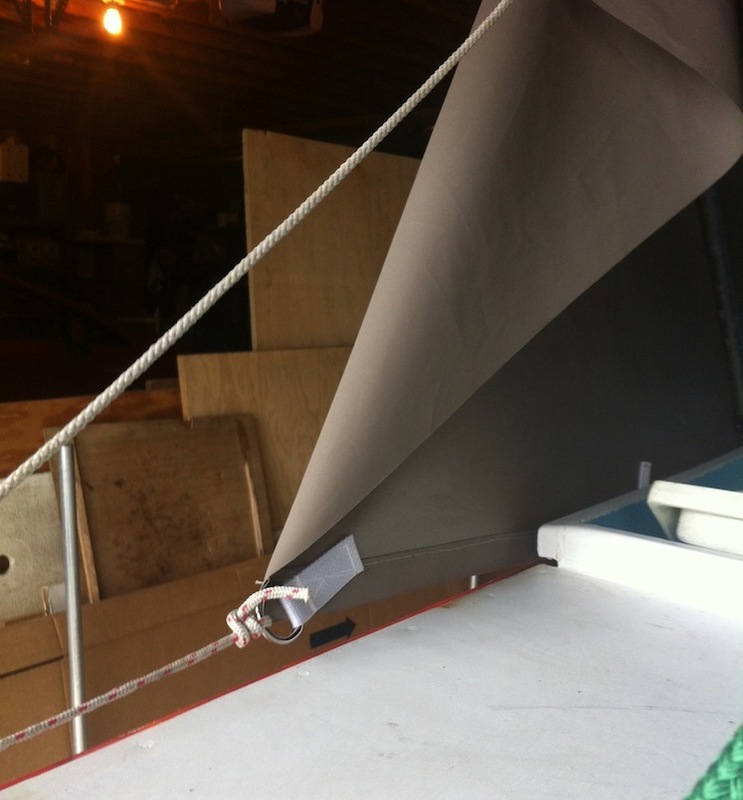 The corners are tied to the stern mooring cleats. I am very pleased with the results. The tent only takes about 6 minutes to setup. I will probably sew in a few windows and I may fabricate a panel to cover the stern.